This time of year it is easy to get distracted with so much extra going on. I like to stay organized with my gifts for everyone that I have to buy for. 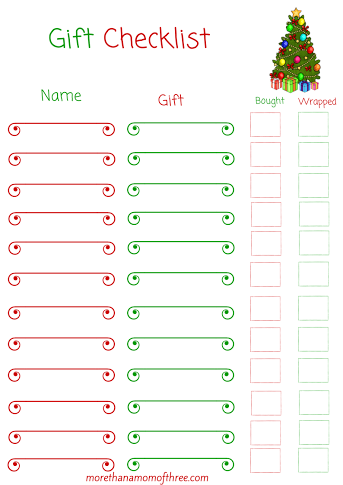 This Christmas Gift Checklist Printable helps me stay on track with what I have to buy, already bought, who it is for and if I wrapped it or not. I do most of my shopping on Black Friday but I do pick up things during the year if I find it to be a great deal. This week before I head out to start shopping, I am going through what I have already and write it down. Maybe even get a little wrapping done too. I never want to wind up with the same thing twice or forget something altogether so this is perfect for me. I can keep the Christmas gift checklist printable right in the Christmas section on my home management binder. Watching my kids or my husband open exactly what they wanted brings me such happiness. I’d hate to have that moment wasted because I was juggling too much. I hope this helps you stay organized this year for your Christmas shopping! It’s free to print as many as you need. Shopping for the holidays should be fun not stressful. Download your copies of the free Christmas Gift Checklist and get more organized and less stressed about shopping this Christmas. That is a really cute checklist. I need to print it to keep me organized. This is a very cute printable. This would be a great addition to a child’s letter to Santa. Myrah – Coupon Mamacita recently posted…Shop Your Way Shoes Have You Heard? Cute! Such an easy printable! Thanks so much for sharing this! Pinning it to my Christmas board. I like this list. I had not seen one that included wrapped on it and that is handy to have. Great printable! What an awesome resource for keeping all of your gifts and who they are for organized. I’m all about anything that eases stress over the holidays. Cool! Thanks for the awesome printable. I will definitely be needing one. I am totally going to use this today. I am so behind this year and need to get busy. Carlee C recently posted…6 Reasons Why The Shark Rotator Powered Lift-Away Upright Vac is AWESOME! This is too cute. Thanks for the printable. It will come in handy! What a cute checklist! Thanks for the printable! How cute! Thank you for the great printable! Ok, this would help keep me so organized during the chaos that is holiday shopping! There’s something so satisfying about checking the list off. Plus, this one is super cute! Mary Hill recently posted…Let’s Linkup and Socialize! Great idea! I totally need this! Pinned and tweeted. Thank you for being a part of our party. I hope to see you on Monday at 7 pm. It wouldn’t be a party without you! Thrilled that you linked up with us today~ What a super idea! Thanks so much for this printable! I love that you have a separate box for “wrapped!” I love to pick up gifts all year long whenever I can get a good deal, so this is going to be so helpful for me! I love a good checklist- this is a great idea.Thanks for linking up at the party!